, an excellent antiquary, and founder of the Gentleman’s Society at Spalding, was descended from a family much distinguished in the last century. At Berkhamstead, the seat of one of his relations, were half-length portraits of his grandfather, old Henry Johnson and his lady, and sir Charles and lady BickerstafF, and their daughter, who was mother to sir Henry Johnson, and to Benjamin Johnson, poet-laureat to James I. who, agreeably to the orthography of that age, spelt his name Jonson. Sir Henry was painted half-length, by Frederick Zucchero; and the picture was esteemed capital. The family of Johnson were ajso allied to many other families of consideration. 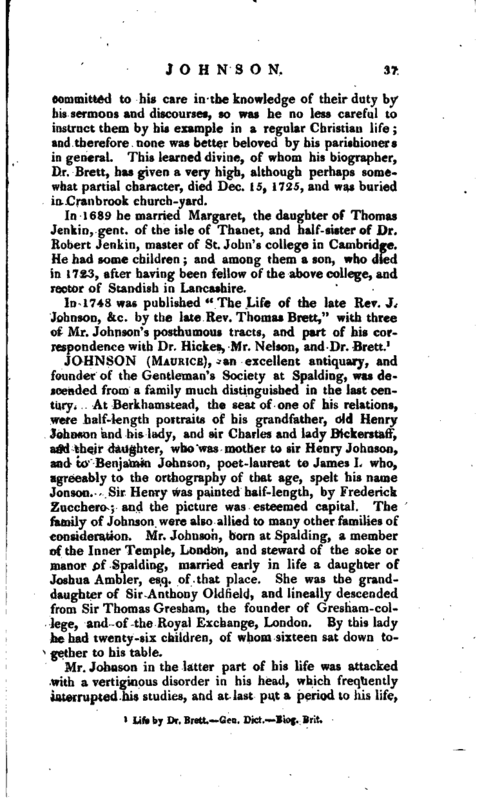 Mr. Johnson, born at Spalding, a member of the Inner Temple, London, and steward of the soke or manor of Spalding, married early in life a daughter of Joshua Ambler, esq. of that place. She was the granddaughter of Sir Anthony Oldh’eld, and lineally descended from Sir Thomas Gresham, the founder of Gresham-coilege, and of the Royal Exchange, London. By this lady he had twenty-six children, of whom sixteen sat down together to his table. 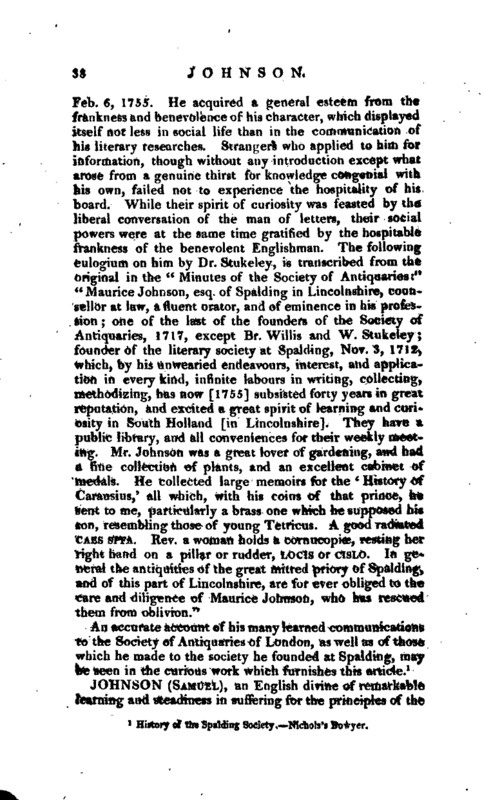 History of the Spalding Society.—Nichols’s Bowyer.